We have had a series of Outlook related posts. It is a good time to test how much you have learnt. What is Quick Click in Outlook? Also specify a practical usage scenario for it. 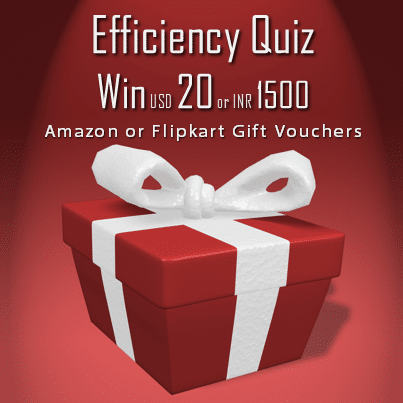 The quiz is open till 12:00 PM IST on Tuesday, 11th Feb 2014 (to ensure that readers from other time-zones can also participate). one can set the quick click for setting the flags for default action. Under followup there is a option of setting the quick click. This can be set to default flags like today, tomorrow, next week etc or custom flag can be created. By setting the quick click one can just click on flag status at mail and mail flag status would be set to the default action as set by quick click. Multiple mails can also be selected. Practically if one want to follow the mails for next day he can set the quick click to next day and then can change the flag status by just a single click. Quick Click: look at the top right hand side of ur outlook <> do u see Outlook logo, yes next to that, the task u do most in outlook e.g: Ctrl+N for new Email, REDO, Touch Enable device, yes yes, that’s what we call quick click you can add more options to it based on your usage. Quick Click is a feature in Outlook 2007 onwards that allows you to tag an email with a color coded category (default: Red Category, but both the color and name can be changed), with a single click in the Category column in the email list view next to the flag icon, without actually flagging it for a follow-up action which would cause it to show up in the Todo bar. A common usage scenario is to mark an email as Important to be read later (whereas if it actually needs a follow-up action e.g. reply or some other workflow action, then one can use the flag to mark it for follow-up (or manually drag it to the Todo task bar). I have set my quick flag to personal category. It is a follow up flag. Thank you for posting answers. I posted this quiz at 18:00 IST and decided to keep it open only till 11:59 IST. I realized that it is unfair to readers in other time zones. Therefore, I am extending the deadline for replying to the quiz till 12:00 (noon) on Tue, 11th Feb 2014. Will declare the winner tomorrow afternoon. Quick Click in Outlook helps in setting a follow up flag and the default is today. The practical scenario is to create a to-do list task and follow people if you have assign the task to some one. Congratulations!! You are the winner of this quiz. Please send your email id to nitin@maxoffice.biz and we will send you the gift voucher. Please do share on which email id would you like us to send the gift voucher.